By 1850, Samuel Colt had come to dominate the American revolver market, aggressively defending his patents and using advanced manufacturing processes to out-produce rivals. 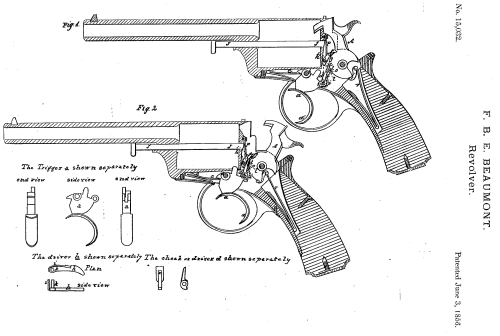 Meanwhile in February 1851, British gunsmith Robert Adams patented his double-action revolver design. The key advantages Adams’ revolvers had over Colt’s were their larger caliber and double action. This made them fast-firing and hard hitting. You could shoot them with one hand, making them ideal for the sort of close-quarters combat British officers found themselves in during colonial campaigns. Colt attempted to gain a foothold in Europe in the early 1850s, setting up a lavish display featuring his pistols at the Great Exhibition. It was at the exhibition that Colt faced his first competition from Adams. London gunmakers George and John Deane’s stand displayed a plethora of products from a number of British gunmakers from London and Birmingham. Among them was a finely-decorated Adams Revolver, which enjoyed much interest from visitors. Despite Colt gifting various presentation pistols to dignitaries and demonstrating the impressive interchangeability of his weapon to fascinated crowds, at the end of the exhibition Deane & Deane won a prize medal while Colt received only an honorable mention. Undeterred, in 1852 Colt established a factory in London, hoping to gain lucrative military contracts from Britain and Europe. Initial orders from the Royal Navy for 9,500 revolvers and the British Army for 14,000 revolvers were encouraging. But the British became steadily more interested in Adams’ revolvers. During trials at the Woolwich Arsenal, testers found that the Adams was faster to reload — 38 seconds to the Colt’s 58 second. The Adams was also more accurate and suffered no misfires, unlike the Colt. Colt was unwilling to move away from his own open-frame, single-action designs in order to compete with his British rival. In 1856, Colt was compelled to close his factory. Adams himself had initially worked as manager of the Deanes’ factory. It was with Deane & Deane that he first manufactured and sold his revolver. The success of the pistol following its unveiling at the Great Exhibition in 1851 saw Adams elevated to partner with Deane & Deane. Adams’ design was the first successful double-action pistol on the market. With the pull of the trigger, the gun’s cylinder indexed and the hammer cocked and dropped — firing the gun. Not only was Adams’ revolver the first double-action revolver, it also had a rudimentary safety mechanism. Adams added a flat spring to the left side of the frame that the shooter could depress into the frame, locking a pall into the hammer and preventing it from going forward. Adams’ first pistol, the ‘Dragoon’ model of 1851, fired a large .49-caliber ball with immense stopping power. This model had a long barrel, making it cumbersome in close quarters. Adams also introduced an infantry revolver chambered in .44 caliber. This second, improved model had a shorter barrel. Adams’ revolver still lacked a loading lever and throughout the weapons life, the gunmaker added a number of different loading systems, including those patented by John Rigby and James Kerr. 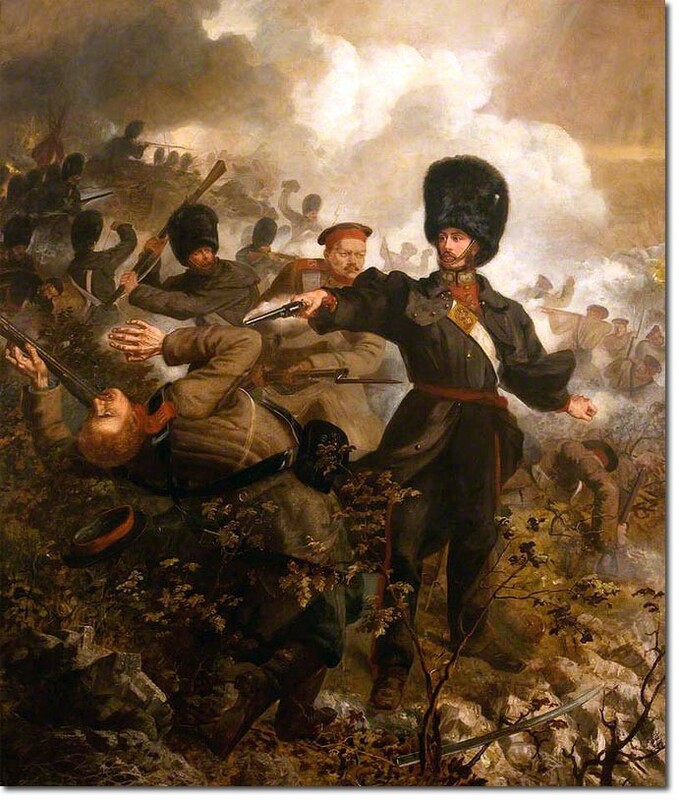 While some elements of the British military were skeptical of the advantages of the revolver, experience during the Crimean War and Indian Mutiny of 1857 began to change opinion. Captain Joshua Crosse of the 88th Regiment of Foot — the Connaught Rangers — wrote to Adams after the 1854 Battle of Inkerman, describing how his Adams Revolver saved his life. Crosse was not alone. During the Indian Mutiny, many officers regretted their lack of a revolver. A Lieutenant Kutznow mourned that he “had not had a couple of revolvers.” Instead, officers and cavalry relied upon the standard issue muzzle-loading percussion pistols. Colt embraced more modern mass-production methods. Adams’ guns, by contrast, were produced by a dozen small makers in Britain and Belgium. This slowed overall production, but the fit and finish of the Adams-pattern revolvers were better. Adams’ revolvers were also marginally quicker to reload, the lack of integral loading lever notwithstanding. They also benefited from a solid frame with a top strap — something Colt would not introduced until 1873. One complaint was that, while the double-action trigger made the revolvers fast-firing, the heavy trigger-pull affected accuracy. Adams rectified this problem in 1855 first by adding a hesitation lock and later by integrating a single- and double-action lock patented by Lt. Frederick Beaumont, an officer from the Royal Engineers who admired Adams’ pistol. Beaumont added a thumb spur to the hammer and an extra sear to hold the hammer when it was manually cocked. An animation of this process can be found here. The Beaumont-Adams Revolver also added a safety of sorts with the addition of a sliding stop that prevented the indexing of a new cylinder. Despite an initially successful partnership with Deane & Deane, Adams left to form his own company in February 1856. The newly incorporated London Armoury Company produced the improved Beaumont-Adams Revolvers, which also featured a new integral loading lever designed by Kerr, Adams’ cousin and a stockholder in the new company. Kerr later invented the Kerr’s Patent Revolver, which was also produced by the London Armoury Company after Adams left the firm in 1859. By the mid-1850s, the British government had made significant purchases of Adams’ revolvers — buying 19,400 Beaumont-Adams in 1855 and 1856 and a further 7,300 breech-loading Mk I, II & III Adams Revolvers between 1869 and 1880. Despite these orders, it was not until 1878 that the British Army issued revolvers to mounted troops. Improvements continued, and in 1860 Robert’s brother John Adams patented his improved, two-part revolver frame, which simplified the manufacturing process. With the invention and increasing popularity of metallic cartridges in the late 1860s, John also patented a method of converting cap-and-ball revolvers to fire the new cartridges. These refitted pistols and later Adams designs fired self-contained cartridges and were adopted by the British Army in the late 1860s and throughout the 1870s. In 1867 John Adams formed his own company, the Adams Patent Small Arms Company. Building on his brother’s earlier work, he patented his own revolver design which the British government adopted as a replacement for the older Beaumont-Adams Revolvers. John’s new pistol was chambered in .45 caliber and had a six-chamber cylinder. It was the British Army’s first self-contained, center-fire revolver. The army adopted the new Mk. I Adams in 1868, the Mk. II in 1872 and the Mk. III in 1878. The Mk. III was the culmination of a number of improvements over previous models and boasted a more efficient extractor and a better loading gate. The various Adams Revolvers saw action across the British Empire during the Indian Mutiny, the Bhutan War, the Anglo-Zulu War and Second Anglo-Afghan War. They were the British Army’s standard-issue sidearms until the early 1880s, when the Enfield Mk. I debuted. Robert Adams died in 1880 at the age of 71.